I've been wanting to making a quilt for YEARS. About a year ago (maybe more recently), a friend gave me tubs and TUBS of fabric that had belonged to her mom, who was an avid quilter. I've used the fabric for different projects along the way, but I finally got inspired to finally take the leap before Christmas to use it for an actual quilt. I always love making at least some of my Christmas gifts. According to my husband, that's how I find myself overwhelmed and behind schedule during the holiday season. 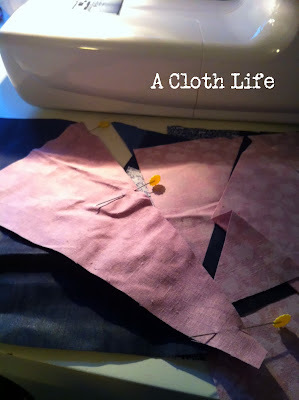 I was inspired by this quilt called "Controlled Chaos" when it was featured on the blog Joy of All Crafts. I decided that a pattern like that would be perfect for me - for my first attempt at least. I took the idea and sort of created a non-pattern. And a quilt for a toddler bed would be the perfect size so I wouldn't get completely overwhelmed with the project and never finish. I started off by cutting the appropriate number of 8" squares from my fabric. 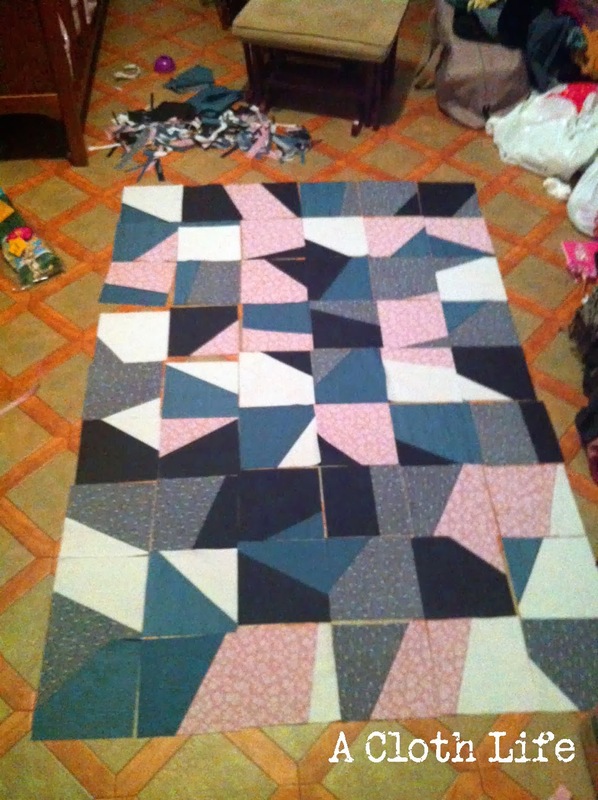 Then I would lay two squares on top of each other and (using my rotary cutter), I'd slice a section off, then swap the pieces to create a two-toned square. After piecing the squares back together, I evened them back up as 7" squares to make things easier for me down the road. Then I laid all the pieces out to figure where I wanted all my pieces. G definitely had a hand in this step. I took this picture so I wouldn't forget, in case my rows got mixed up. 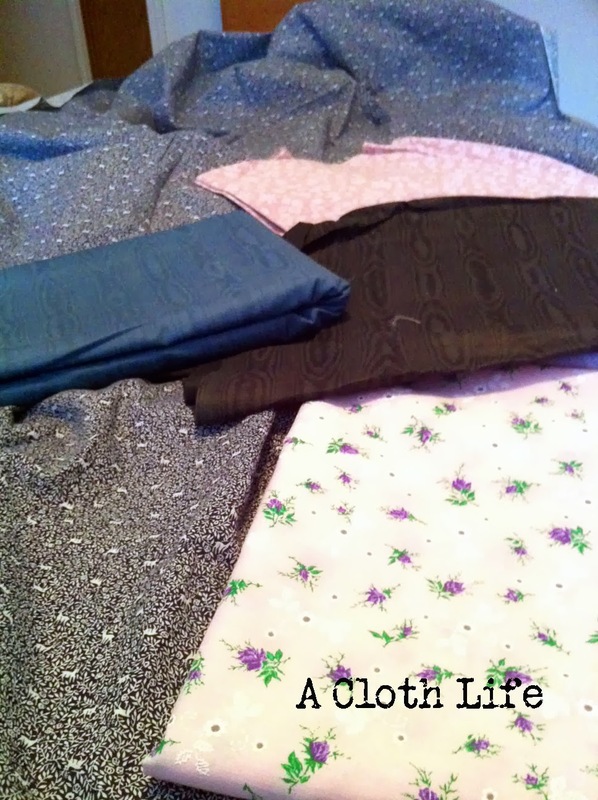 I definitely got good use out of this (albeit blurry) picture while piecing my rows together! 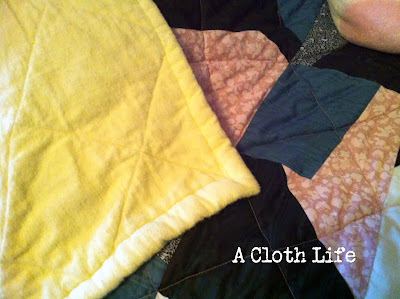 Once I got the top all sewn together, I added batting and a yellow flannel for the backing. I machine quilted the whole thing, but I honestly have no idea how people machine quilt larger blankets. It got tricky at times. 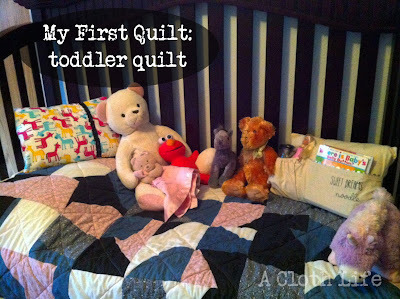 I want my next quilt to be for G's bed. At this point (since it has been YEARS since he slept in a toddler bed), I'm planning out hand-quilting. We'll see how it goes. I really should look up some more tutorials. In the meantime, you can check out my quilting Pinterest board here. And please, feel free to share any quilting related tips with me in the comments!